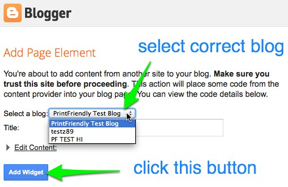 You can easily add the PrintFriendly button to your blog using the Add Widget Tool. If you prefer to do things the hard way, then you can manually add the PrintFriendly button. Step 1: Get the PrintFriendly button. Select your preferred button style. 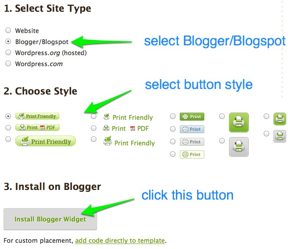 Click the Install Blogger Widget button. Step 2: Tell Blogger Where to Install. * If nothing happens, note that PrintFriendly currently works on any of the Classic Blogger/Blogspot templates. We are still working on getting this to work on the new Dynamic View template. The PrintFriendly & PDF button will now appear at the bottom of your posts. what an easy and simple way to add print friendly to a blog page. Is there a way to move the button to the top of the page? Grazie!!! Utilissima implementazione!! Molto Professionale!! Hello. Great widget. It is an added plus to my blog. As my blog is a culinary blog, I wanted the print button to be positioned just on top of the recipe section. Is there a way of moving the button to the top? Thank you in advance for your reply. It worked except for a couple of my posts. Can anyone help? Which posts did it not work on? Share us some links! The install widget button is still there when you visit http://www.printfriendly.com/button and choose Blogger from the select buttons. Are you not seeing this? Have you figured out a fix for Blogger Dynamic View Templates yet?? I would love to put this button on my recipes blog. Hi, The Blogger Dynamic View prevents us from adding our code to the template. So no, unfortunately, we haven't yet been able to find a way to get our button to Blogger Dynamic View templates yet. I do not have a dynamic view template but I cannot see the printer friendly widget. When I select layout I can see the widget(so its there), but it does not appear when I select view blog or preview. Please send an email to support@printfriendly.com with your blog URL. Please send an email to support@printfriendly.com with your blog URL.. If you're using Bloggers Dynamic Template it likely will not work. Else will work fine. Incidentally, the link in the help area has an extra fullstop, so it doesn't take you to the correct destination. Incorrect link: http://printfriendly.com/button. Ack! Thanks for the alert. Fixing now! I've tried this many times today. No luck. I wasn't sure if I was using a dynamic version, so investigated. To the best of my knowledge, no. What I get when I go to the install on blogger button is a page with only a #. Nothing else. Any advice? Hi Kay, can you email me at support@printfriendly.com? I'll help you troubleshoot this further. 1. Does this simple way of adding Print Friendly apply to Blogger's Picture Window template? 2. The Terms of Service require that users give permission for Print Friendly to place ads on my blog. What kind of ads, and how often? How large? I'm not sure about Bloggers Picture Window Template. You'd have to try. We show two unobtrusive ads in the print/pdf confirmation window. Thanks. I've tried several times without success. I'll try again. I really want this to work! i'm trying and trying, but with no succes so far. i follow al the steps, don't understand what i'm doing wrong. button doesn't appear. Are you checking the post pages, or the homepage? Buttons only appear on post pages. how can I let users print with no picture? There's an option for images "exclude" in the features when you get the button.